The 42-room, four-story Bristol Harbour Hotel & Spa provides a dose of 21st century chic to Bristol’s Old City and its stately Victorian and Georgian facades. The British-based Harbour Hotels has turned two ornate bank buildings, including one inspired by a 16th century Venetian library, into stylish accommodations (it opened in late 2016). Public spaces now burst with vibrant colors and exuberant modern design set against a backdrop of curving stone walls and intricately carved friezes that are more than a century old. The property is in the heart of the cobblestoned Old City just opposite St. Nicholas Market and its bustling glass-covered arcade, along with lots of restaurants, bars and night life. Most of Bristol’s main attractions are within a 20-minute stroll, including the massive ocean liner-turned experiential museum S.S. Great Britain, the local history museum M Shed, the Wills Memorial Building, and two works of street art from the city’s most notorious son, Banksy. We had booked a Superior Double, the lowest tier available, but got upgraded to a Deluxe Double, the next tier up. At 323 square feet (32 square feet more than a Superior), it was surprisingly roomy. The comfy king-size bed had a tall tufted headboard, and was topped with a fluffy white duvet, a tan and gray coverlet and plenty of pillows. Matte gold reading lamps flanked the bed, as did a wooden writing desk and nightstand. There was a burnt orange velvet sofa at the foot of the bed, as well as a brown leather armchair with a seat cushion upholstered in a bold floral-patterned fabric. The complimentary gin and sherry, in mouth-blown glass decanters, along with crystal glasses, were a nice touch. But despite a double-set of windows and heavily lined drapes, we could still hear the faint bass beat of a nearby club going late into the night. The bathroom, entered by a set of double doors, was amply sized, with a bathtub and separate, spacious stall with a rainfall showerhead. There was an extra-wide sink and plenty of marble counter space. Numerous thick white towels hung from a heated rack, and plush white bathrobes were also provided. High-end toiletries by the White Company were scented with notes of rose and jasmine. 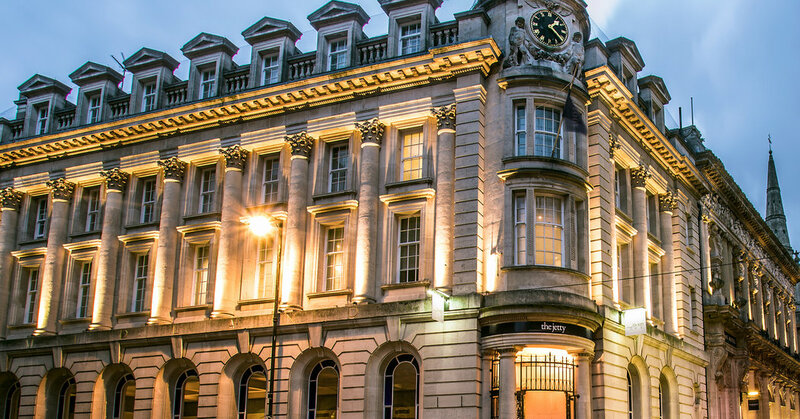 Situated in the former bank vaults underground, the hotel’s small spa offers a hydrotherapy pool, sauna and steam room, free for guests, while treatments such as hot stone massage, are extra. The next-door gym is well-equipped with treadmills, exercise bikes, weight machines — and an original bank vault door. The lobby-level restaurant, the Jetty, is decorated in shades of blue, a reference to both Bristol blue glass, once produced throughout the city — it forms a decorative border around the room’s extra-large windows — and the sea, which inspires much of the menu. Addictive, lightly floured cockle “popcorn” arrived hot and crisp in a miniature copper pan, and lobster bisque topped a creamy cheese soufflé. The stylish Gold Bar served creative cocktails like the Clear and Breezy, a fizzy, zesty twist on the classic Dark ‘n’ Stormy. Our lush breakfast, ordered up to our room, included delicious grilled kippers with caper beurre noisette, and toast accompanied by butter served in a scallop shell and a selection of Wilkin & Sons jam and honey. Unfortunately, it took an agonizing 50 minutes to arrive. The Bristol Harbour Hotel & Spa offers plush accommodations and high-gloss design in an Old World setting, conveniently located near many of the city’s main attractions. Just make sure to bring earplugs. April 21, 2018 Comments Off on Missed this week’s entertainment news?